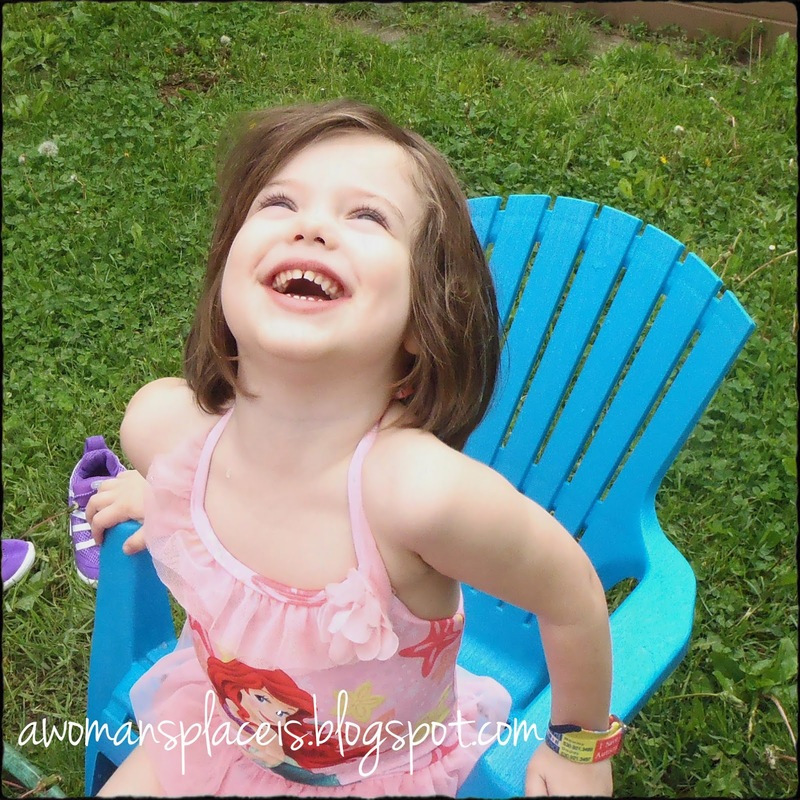 Someday I'll Sleep Autism Blogs: 7 Quick Takes Friday: Mae Bae Update Edition! The other day as I was walking upstairs with Maggie I said "I love you!" and she said "I love poo!" which I'm pretty sure is "I love you" and not a declaration of love for the Pooh Bear stuffed animal in Patch's room. At least that's how I'm translating it! That would be the second "I love you!" ever! She's also been giggling while repeating "Happy! Happy! Happy" in her little sing song voice, which just about makes my day. Mae can be pretty good at labeling things. She has said words like "pencil" and "bouquet" to identify objects and now and then shocks us by saying one word (usually one time) that seems so out of the ordinary for a tiny little girl who's most frequently heard sayings these days are "mermaid," "purple fish" and "yellow fish" when talking about her imaginary world where everything is under the sea. A while back I wrote about how one day during Mass she pointed to the light in the narthex and repeatedly told me, for the rest of Mass, "no rainbow" while sweeping her hand to make a large circle around the light with her finger. She did it again a few weeks later while we were inside our church while pointing to the light around the crucifix. A couple of days ago while we were sitting at the table I saw her looking up at the simple hanging light fixture on the ceiling in my parent's dining room. "Maggie, does that have a rainbow around it?" I asked, suddenly curious, since the two lights in our parish that don't have rainbows seem to be so shocking to her. She paused thoughtfully, watched the light for a moment more and said "Rainbow. Yeah." in a small voice before going back to coloring. So... Finding an optometrist who specializes in little kids (or special needs) is at the top of my to do list when we get back to Michigan. Maggie loves animals and I've seen how Kitty Fish can have a calming effect on her, but for the most part Kitty Fish gives her a wide berth. After much thought and discussion with Paul, I completed and application for a Michigan based service dog program, that donates dogs to families of children with autism (they are 100% funded by donations and provide the dogs to families who are approved at no cost to the family). They also try to find Labradoodles for families with dog allergies. The application process (off the top of my head) starts with an online application and if that is approved, goes to a paper application, then a form for the child's doctors and finally an in home visit by someone from the non-profit. I filled out the first application earlier this month and Paul told me last night that they sent us the paper application to send back, so I'm cautiously hopeful! Prayers are very much appreciated that this will actually become a reality! Mae loves animals so much and I truly believe this could be such a help to her! Mae's empathy for Patch has reached the point where if he cries or fusses at all she running over to point it out to me, tears rolling down her own face, pointing out his tears while looking over to make sure I'm moving towards them. She also can definitely tell the difference between his fake cries (90% of the time) and his real cries and while the fake ones are equally loud won't even glance in his direction. Sensory problems can pop up at the most unexpected times. One of the triggers we've come across most recently has been Sadie sneezing or coughing, which would result in instant unstoppable tears and often collapsing to the ground as if she's in agonizing pain. At least until two days ago when Sadie was sitting next to her and sneezed. Everyone froze. Mae looked up, reached over and pushed her arm playfully and then started to giggle. I haven't seen her reaction to an actual cough since "the sneeze" but with a sister who's sneezing and coughing pretty constantly this time of year, even with allergy medicine, I'm really hoping that this might be a sign that her brain is starting to process this often heard sound a little bit differently. I hope! It's over (we hope!)! Paul took bar exam and called right after he finished to let us know that it was done. Neither of us could really believe that it could possibly be finished. After so many years of grad school (six altogether) the fact that his formal schedule of going to classes and studying late into the night might actually be over (and replaced by work!) is so strange and wonderful! I'm praying the test results make that possibility a reality! How long will it take for y'all to find out if he passed the bar? I've been wonder as I've read your last couple posts about it. Keeping prayers coming your way! Thank you both for the prayers! I think we're supposed to find out sometime around October! I know it will be here quickly but it feels like such a long wait! It seems ridiculous that bar exam results take so darn long!!! It affects law school grads' ability to find jobs, and even the rankings of law schools because the success of their grads in being hired factors into those rankings. Step on it, people! Hire some more graders!